Ruby gets a princess-worthy primer on manners in this charming picture book from #1 New York Times bestselling illustrator Robin Preiss Glasser and author Sarah Ferguson, The Duchess of York. Ruby does her best to have good manners--yet no matter her efforts, she just can't seem to succeed. But when Ruby receives a mysterious surprise invitation to tea with the Queen, she is especially determined to polish her poise. She goes from the postman to her brother to the playground to her parents, trying her hardest to have manners befitting a princess. Will she ever manage to be proper in time for tea at the palace? In this New York Times bestseller, cheerful, elegant text from Sarah Ferguson, The Duchess of York, pairs with Robin Preiss Glasser's "exuberant illustrations, rendered in her unmistakable Fancy Nancy style (Publishers Weekly)" to create an endearing and gently instructive story about manners. 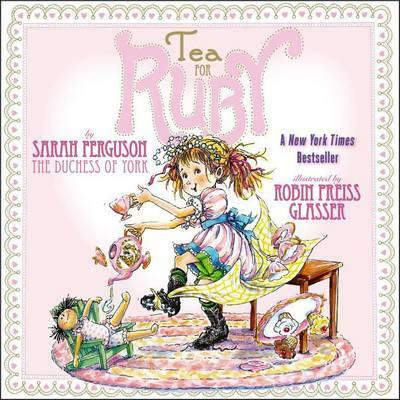 Sarah Ferguson, The Duchess of York, is the author of several children's books, including Ballerina Rosie; Tea for Ruby, illustrated by Robin Preiss Glasser; and the Little Red series as well as a memoir, Finding Sarah. The Duchess is a devoted spokesperson for many charitable organizations, including Changes for Children. She has two daughters, Princess Beatrice and Princess Eugenie. Robin Preiss Glasser is the #1 New York Times bestselling illustrator of the Fancy Nancy series, written by Jane O'Connor; America: A Patriotic Primer, A Is for Abigail, and Our Fifty States by Lynne Cheney; and Tea for Ruby by Sarah Ferguson, the Duchess of York. She lives in Southern California with her family.